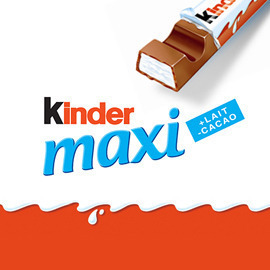 Show how Kinder Maxi brings back carefree childhood feelings in adults ! Kinder Maxi, a chocolate bar made of delicious Kinder chocolate, caters to adults who want to indulge in a pure moment of relaxation. It is made of the delicious chocolate from their childhood (“Kinder Chocolat”, & “Kinder Surprise”) and is wrapped individually and the portion is specifically suited to adults. Having a Kinder Maxi will make you feel the gustatory pleasure that you knew since you were a child and so letting you enter a carefree and lighthearted mood. In a video or animation, show us how Kinder Maxi triggers your senses, while offering a welcomed break. Thanks to its sweet taste that brings back warm childhood memories, you can look at life again with in a light-hearted, carefree and joyful way. Format: videos or animation, 30 sec. Send your amazing and creative kinder video before February 16, 2014. Good luck everyone!